"We've spent the last year recording a new record. This is the first show we're actually gonna try some of these songs," Brad Barr disclosed last night at Rough Trade. It was the final day of Brooklyn's Northside Festival, and the Barr Brothers show was the only one I wanted to see. Just days before, the band had announced their long-awaited follow-up album, Sleeping Operator, due in the fall, so I was jonesing for some new music. The band began the set huddled together as a unit, harmonizing sweetly on "Little Lover." Two minutes in, the members spread out to their positions, Andrew Barr kicking in on the drums and Sarah Page swapping her smaller harp for the imposing full-size one stage left. The audience was a tad chatty for new song "Wolves," but they quieted for "Even the Darkness Has Arms," which saw Brad, Andrew, and Sarah all picking up guitars to play the Appalachian-style number. At its completion, Brad took the time to wish everyone a happy Father's Day, adding, "I became a father recently." The crowd clapped. "You drink enough Jameson, it's easy," he laughed. Brad started "Half Crazy" on banjo, but abandoned it for an electric, whipping the tune into a blues rock dragon with his slide as Page plucked frantically at her harp. They followed it with the familiar "Ooh, Belle" and "Beggar in the Morning," with Brad lyrically tugging on the crowd's heartstrings as he literally tugged on the strings dangling from his guitar. 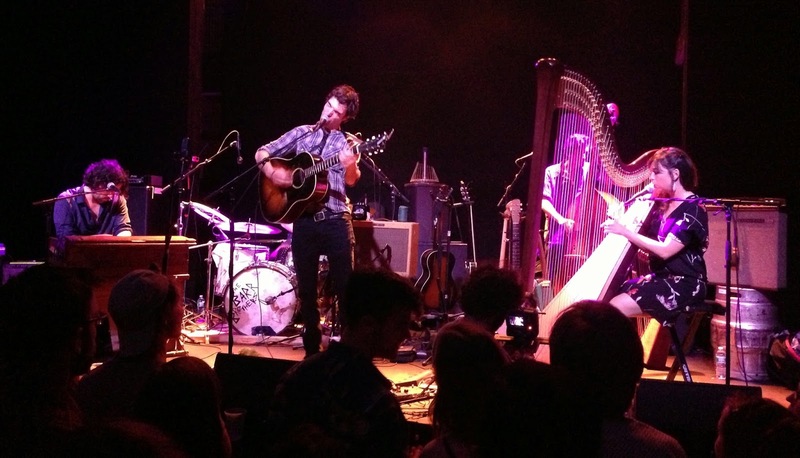 The Barr Brothers have a complex stage setup in that every member of the band sings and plays at least two instruments, not to mention that half of said instruments look like they were found in the scrap heap at a junkyard. An earlier mishap had reset all the work done during soundcheck, so it was a constant battle for the band to get the correct monitor levels and avoid feedback. They were patient with the sound crew though, and aside from Brad's mic being a little too quiet, the house sound was fine. The band closed with three more Sleeping Operator cuts: "Love Ain't Enough," "Come in the Water," and "England," the last of which Brad played on a guitar fashioned out of a rusty toolbox. "Whoever said fathers should not take LSD was not on LSD," said Barr as he picked up his toolbox once more for the encore. "Just kidding," he clarified. The Barrs plowed into "Lord, I Just Can't Keep from Crying," turning in a nearly 9-minute rendition. Brad played with such intensity that the toolbox became unlatched by the song's end. That would've been a perfect finale, but the fans wanted more, rattling furiously on the COSCO shipping container wall of the venue. The band chose "Cloud (for Lhasa)," which was a little too soft a finish after the dirty blues of "Crying." According to the onstage setlist, both "Crying" and "Cloud" were to be played in the set prior to "England" with an encore of "Please Let Me Let It Go" and "Give the Devil Back His Heart." And while I would've preferred the devil (Probably the first time I've ever written that! ), I wasn't disappointed. The Barr Brothers finally have a new album coming out.